Not a bad game, but the most straightforward victory of the tournament so far. The team news was significant, because Colombia coach Jose Pekerman chose to use a 4-2-3-1 rather than the 4-2-2-2 he often fielded throughout qualification. This meant James Rodriguez shifted inside from the left to play as the number ten, with Juan Cuadrado on the right and Victor Ibarbo brought into the side to play on the left. This meant Colombia had a very defined structure, with a creative number ten and two speedy wingers, and these three were the crucial players in Colombia’s victory. Rodriguez is a very attack-minded player, but the interesting thing about his role in this game was the way he was happy to drop deep and collect short passes from the central midfielders, who remained in position and kept their distribution simple. 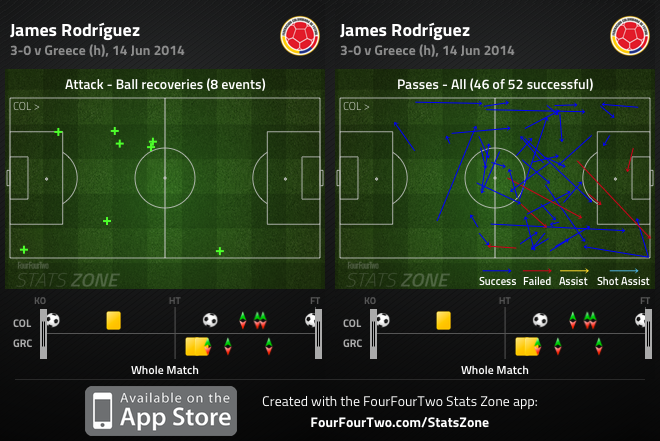 Rodriguez didn’t expect those two players to find him in dangerous positions with good forward passes, and instead helped Colombia penetrate the Greece midfield by playing those passes himself. The first goal was a good example – Rodriguez moved deep, turned, and dinked a pass into the left-back zone for Cuadrado to chase. It was entirely predictable that Colombia’s breakthrough would come from their right-winger, Cuadrado. He is one of the tournament’s best dribblers from wide, while the Greek left-back Jose Holebas continually gets himself into extremely high positions, leaving space in behind. He’d already dived in recklessly on Cuadrado even before the fifth-minute opener, which perfectly summed up the problems with Holebas – there was too much space in behind him, which Rodriguez found perfectly with his pass to Cuadrado. The winger later set up the third goal, for Rodriguez. Ibarbo also provided pace on the opposite flank, running against Vasilis Torosidis, but also darting inside into more central positions. He was more inconsistent with his end product, but was always a threat. There wasn’t more to the tactical battle, although it’s worth pointing out that the Colombian pace on the flanks was in stark contrast to the Greece display. Georgios Samaras always comes towards the ball, while Dimitrios Salpingidis was surprisingly quiet on the opposite flank. With Theo Gekas barely able to run these days, there was simply no penetration and little goal threat. A hugely surprisingly result – but this wasn’t a smash-and-grab. Costa Rica fully deserved the victory against a Uruguay side that seemed utterly clueless in possession. There have been various types of matches at this World Cup so far. 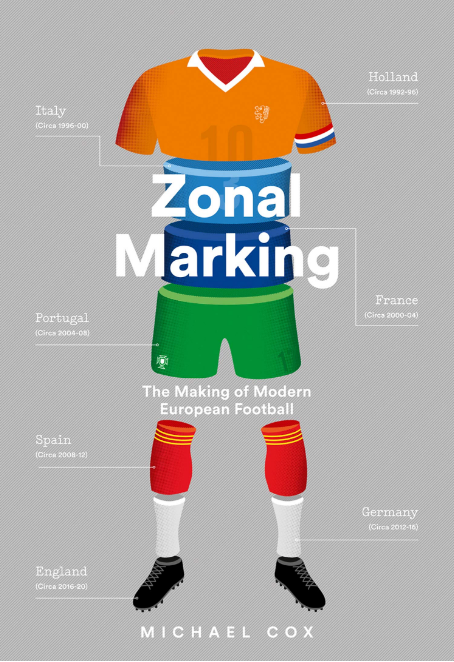 Brazil 3-1 Croatia was all about crossing, Netherlands 5-1 Spain all about through-balls. This was a match lacking in technical quality, and therefore it was largely about set-pieces. Aside from some fine Costa Rican counter-attacking, the major chances came from dead ball situations, with the five centre-backs seeming better at attacking set-pieces than defending them. Uruguay’s goal came after Diego Lugano had his shirt pulled by Junior Diaz when challenging for an inswinging free-kick, with Edinson Cavani converting the penalty. Costa Rica’s second goal was an Oscar Duarte header from a free-kick, minutes after he’d failed to take an identical chance. It seemed something of a contrast from other games in this first week, but set-pieces are often crucial in tight, defensive games. It’s been a good tournament for three-man defences so far – Mexico beat Cameroon with a back three, Holland overcame Spain with a back three, while Brazil, Chile, Italy and the Ivory Coast have also won having occasionally dropped a midfielder into the backline. 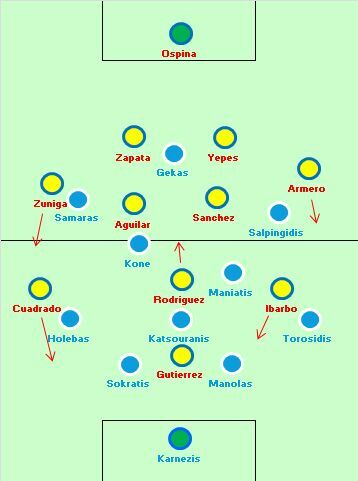 But those sides generally played a three-man defence in a possession-based system. Costa Rica took the opposite approach – they sat back extremely deep to soak up Uruguayan pressure, and in reality it was more of a back five than a back three. The strange thing about Uruguay’s approach was how easily they played into Costa Rica’s hands. When playing against a back three/five, the general rule is not to play two upfront. That’s exactly what the back three wants – it means they’re not stretched on the flanks, or outnumbered in midfield. They have a spare man, and can sit deep against two strikers without too many problems. Diego Forlan has looked like more of a number ten in recent years, but played extremely high up the pitch here. He failed to connect midfield and attack, which is the primary role of Uruguay’s second striker in this system – it’s usually Cavani, but he played upfront in the absence of Luis Suarez. Forlan doesn’t have the mobility to get up and down the pitch, but it was surprising he didn’t link play with good passing and positioning. This Uruguayan midfield lacked creativity and guile, and it was disappointing Oscar Tabarez didn’t field a more forward-thinking midfielder in a game that was all about breaking down a deep defence. Instead, Uruguay played an amazing number of long balls – and it wasn’t something they resorted to, it was a key part of their opening strategy. Costa Rica looked delighted to be challenging in the air – their centre-backs are brave, combative but poor on the ground. When forced to turn and tackle, they make clumsy fouls – but, amazingly, they didn’t pick up a single booking because Uruguay didn’t ask any questions of them. It wasn’t all about defending and capitalising on set-piece situations, though. Costa Rica had two outstanding performers in this game – striker Joel Campbell and right-wing-back Cristian Gamboa. Fittingly, they combined for the equaliser. Bryan Ruiz, meanwhile, played a nice link role between them. Campbell is primarily about pace, but also showed a willingness to drop deep and link play. For the third goal, his measured through-ball for substitute striker Marcos Urena (having been moved to the right flank) was absolutely superb, and earlier in the game he cut inside and shot powerfully from range. He always starts in the right-centre channel, drifting onto his left foot. He was partly able to do this because of Gamboa’s excellent forward running. The right-wing-back got up and down the line all day, in contrast to Uruguay’s disappointingly conservative full-back pairing. His whipped crosses were also extremely dangerous, and while it was expected he’d be more adventurous than left-sided Diaz, the outright quality of his play was more surprising. 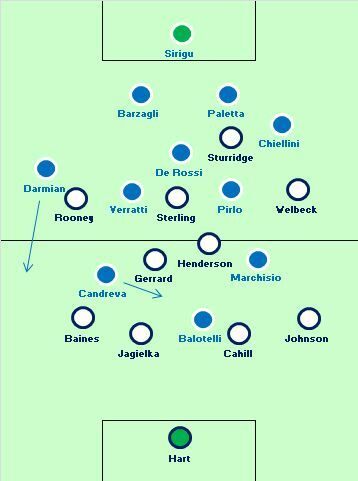 This match was all about the battle in one particular zone – England’s left-back position, and Italy’s right flank. From the opening stages, with Italy unsurprisingly dominating possession, it was clear they were continually looking to work the ball down that side. They made inroads there shortly before their opener, and the game’s three goals can all be traced back to this battle. It was ironic that Roy Hodgson decided not to use Wayne Rooney centrally (with Raheem Sterling in that position – he was England’s best player) because of fears about his defensive discipline against Andrea Pirlo. In the end, he would have been up against Daniele De Rossi anyway, and he actually had far more defensive responsibilities on the left. That’s because Italy’s right-back Matteo Darmian took up extremely advanced positions, with left-sided Giorgio Chiellini staying at home. Darmian was continually free on the overlap for diagonal balls, with Pirlo, De Rossi and Verratti all capable of hitting good passes to that side. Rooney was part of the problem, certainly, but great credit must go to Antonio Candreva, a highly intelligent footballer who boasts great spatial awareness. He played somewhere between a right-wing and a number ten role – starting in the former, drifting into the latter. England had no idea how to deal with this – Leighton Baines was being dragged inside, Steven Gerrard couldn’t cope with a man darting in behind him. The major beneficiary, of course, was Darmian. Such was the space on that flank, Claudio Marchisio actually moved across a couple of times to further overload England. In fact, it was a Marchisio-Candreva combination on the right that won the corner leading up to Marchisio’s excellent long-range strike. But Darmian’s positional aggression was risky, and while Rooney’s defensive shortcomings were causing England problems, it actually helped them get back into the game. Shortly after the opener, Darmian darted forward down the right but Italy’s passing move broke down, which meant Rooney was allowed to break into space in the Italian right-back zone. Sterling found him, Rooney provided a cross, and Daniel Sturridge converted. Darmian’s attacking intentions were both a strength and a weakness for Italy – although the former certainly outweighed the latter. Such was England’s struggles down the left, Hodgson switched Rooney and Danny Welbeck, a more diligent defensive worker, at half-time. But this didn’t solve the problem – five minutes after the break, Welbeck didn’t track back with Darmian, who supplied Candreva. He sold Baines a dummy, then crossed for Balotelli to head in at the far post. This, of course, is the problem with use four outright attacking players. Hodgson was previously seen as a solid 4-4-2 man, favouring hard workers in wide positions. This front four was exciting and inventive – and not far off a 4-2-4 at times – but the obvious downside is the lack of balance, and protection for the full-backs. James Milner, for example, would have tracked Darmian perfectly. Hodgson has widely been praised for gambling with young attacking players, but there are risks. The matchwinner was another key player. Balotelli’s movement throughout this game was excellent, and he’s at his best when unpredictable with his movement. In the first half he was happy moving towards play or sprinting in behind – going close to a goal by chipping the ball over Joe Hart, cleared off the line by Phil Jagielka. But his movement when the ball was wide seemed lazy, and that’s what improved in the second half. Rather than positioning himself between Jagielka and Gary Cahil for crosses, he varied his runs – for the goal, he hung back towards the far post, and nodded in. He was inches away from grabbing a second when darting towards the near post for another right-wing cross. We’re always told that Balotelli’s level of interest is the thing which impacts upon his performance, and this is unquestionably true, but it’s most obvious in the nature of his runs. 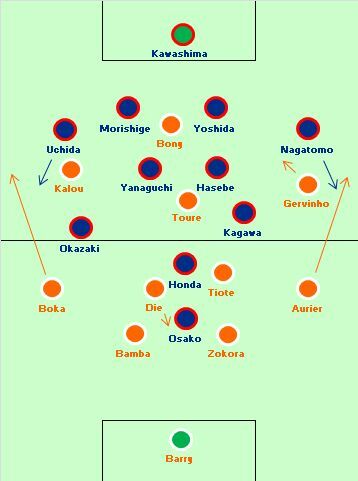 Japan went ahead, but the Ivory Coast always looked dangerous by switching their play out to the full-backs. Keishuke Honda’s 10th-minute strike put Japan ahead, but this prompted them to go surprisingly defensive at a very early stage. They sat back deep in two banks of four, but their defensive shape wasn’t always good. They weren’t compact, sometimes leaving space between their defence and midfield for Yaya Toure to move into, but generally allowing space between their midfield and attack to allow the Ivory Coast time on the ball to switch the play between the flanks. This was an odd strategy – we know about the Ivory Coast’s physicality upfront, and we know Japan aren’t comfortable aerially at the back. Japan shouldn’t have allowed the opposition to build such pressure – they should have kept a higher defensive line and pressed in midfield. Instead, while they went ahead early, Japan were never comfortable. 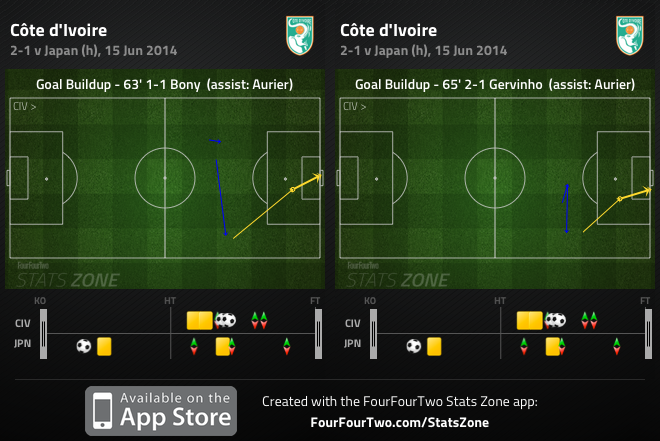 By full-time, the Ivory Coast had recorded 21 shots to 7, and were much the better side. The Ivory Coast’s main approach was to push the full-backs high up the pitch and whip in a stream of crosses. They were allowed most space down the right, with both Gervinho and Serge Aurier getting space near the touchline for quick diagonal balls towards that flank. However, it was on the left where they were most dangerous, because attacking left-back Arthur Boka continually took up advanced positions and whipped crosses into the box. The Ivory Coast only created proper chances after the 62nd minute introduction of Didier Drogba, however, when 1-0 down. He replaced holding midfielder Serey Die, and the Ivory Coast went to a 4-4-2. With two crossing targets, they were now more threatening when the full-backs got forward, and within five minutes they were 2-1 up. Drogba didn’t score either of the goals, but his introduction unquestionably added to the confusion in the Japanese defence when challenging for crosses – they no longer had a spare man, and this allowed first Bony, and then Gervinho, to head in from two right-wing Aurier crosses. It wasn’t a great day for defensive discipline from Manchester United left-midfielders – just as England had suffered from Rooney and then Welbeck’s lack of defensive work, Shinji Kagawa was completely unaware of Aurier’s overlapping, and was caught in central positions for both of the Ivory Coast’s goals. now i had said before that i will be scouting some players . here are the first two who i feel can play for the big team and can be a bargain buy . 1) santiago aribas of colombia :- now even though he came on as a substitute i still feel that he has enough quality to succeed . he is already playing for PSV but is the player to look out for . 2) christian gamboa :- the costarican right back i think had the most touch on the ball and was very active on the right side . he also defended very well and has good pace and balance about he is another in my list . i saw only three games yesterday and could not see japan vs ivory coast . so i cannot conform about aurier . Serge Aurier did pretty well; he got up and down the line adequately and whipped in some dangerous crosses. With these crosses, he provided two assists for Bony and Gervinho. If he continues to perform like today, he will solidify his position for the summer transfer market. Pirlo schooling English kids since 2012. Not much you said about the tactical approach of both teams. 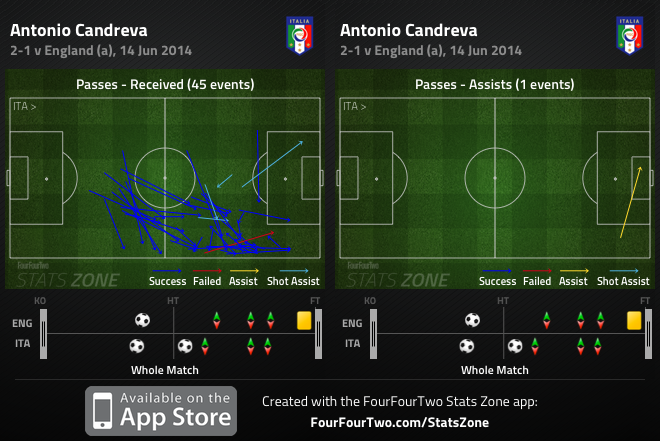 Italy kept the ball and possession perfectly and tired up England by the 70th minute. Excellent passing from the “double playmaker”, but in fact almost everyone in their mid is a playmaker – De Rossi is a very good passer, same with Veratti and Marchisio, Candreva is more of a winger, but he has been playmakering at wide positions for Lazio also. I am not even mentioning the maestro. This Italy team with this midfield and if they get their injueries fixed the full backs are def going to the finals. Perhaps the best mid in this World Cup. In addition to my post – apperantly Italy’s passing accuracy in a World Cup has been one of the best in the last 50 years. Michael is right in that candreva was excellent in this game- with a trio of good passers for italy in pirlo, de rossi and veratti, candreva was the excellent player to provide forwards runs and positioning for crosses. I thought Italy should have put in a trequartista like cassano but the use of candreva was excellent to provide balance between creativity, running and solidity in midfield. 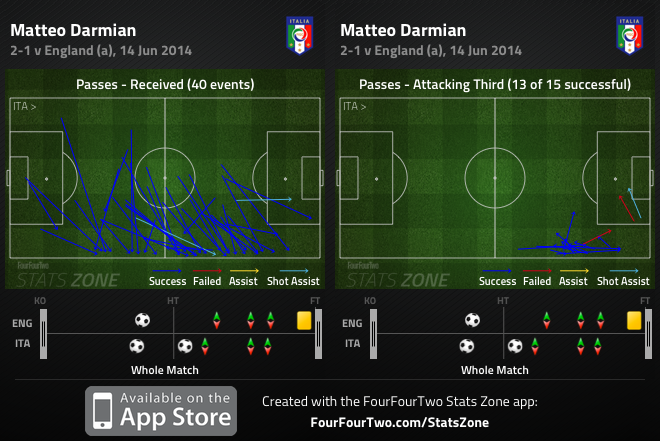 Darmian was good and the workrate of marchisio was crucial in running the whole italy midfield. The only bad side of italy was paletta which was terrible in his positioning- he kept playing the england attackers on side from which rooney got the cross for the leveller. Apart from this veratti was not very effective (that’s how i saw it). I am just thinking if Prandelli actually put in Bonucci for Paletta, Italy would possess ridiculous number of good players with ability to pass long balls over England’s defence, but of course too much a good thing is bad. Paletta is always the better choice in a 2 man defense with Barzali. He is suited for the left side. Bonuchi is poor in a 2 man defense in godly in a 3 man defense. Almost sure he is going to be sold out of Juve. okay i guess that makes sense, but the number of times paletta played england onside was really scary. its like he had no chemistry with the other 3 defenders at all, he was slow and at one time he tried to take the ball past the england midfield and failed. now let us talk about the england game do you really think that gerrard and henderson are the two ideal candidates for the england midfield job . both are hopeless and most importantly gerrard just hasnt got the legs to play the game anymore . instead of that even a half fit lampard is better who can support his front players can do a decent even job of protecting his back four . to be honest the question has england progressed under hodgson . from the day he took over england had been playing safety first . there is no cohesion in the team on offensive end . they are heavily dependent on players personal performances rather than on team effort . i think he needs to work more on the offensive side of the game and if he has some balls then he will drop gerrard for the next game and play an offensive lineup . just compare pirlo or even de rossi with gerrard . i mean he was hopeless even the stupid henderson who was substituted was better . england really didnot had any play when they were going forward just like italy . As a non-Englishman I am a bit bemused by the bipolar reactions – Rooney and Gerrard were not nearly as bad as they’re now made out to be, Rooney almost made winning goals and Gerrard had a number of brilliant long passes. Yesterday’s match could’ve easily fallen the other way, for most of the game the teams looked very well matched. The fact that Italy could lean back the last 20 minutes in this clearly gruelling weather made England look much worse than they actually were. If they don’t get demoralized, they should easily be able to beat CR and Uruguay who both played quite poorly. who do you think i am . i am indian my team is not playing in the world cup . No offence intended, was mostly referring to the outrage on Twitter, in the press, pretty much every guy in the pub, etc. The collective self-hatred of the English football fans never ceases to amaze me. As an Italy fan , I would say this england performed much better than any other england team i have seen for a long time- for once it appeared that england actually had a plan or the players actually knew what was told of them to do-I think we could not fault Hogdson-I think he’s done a decent job in the game versus italy. England setup to do what they were good at and so was italy setup to do what they were good at. Two different sides with different strengths. But I think italy was better in the end because they certainly had the better players imho. It was interesting to see why Uruguay didn’t field a playmaker, somebody to fill the no 10 role for them and link midfield and attack (as you said), it’s almost like they just hoped they would score early against Costa Rica and Costa Rica wouldn’t be good enough to punish them. I think a suitable choice in this game would of been Gaston Ramirez, a player who’s left out a lot for Uruguay and I think he could of really been of use here, they may pay for it by not getting out the group. Uruguay seemed to be playing a 4-1-3-2 formation at least in the second half when they were a goal down. This did not give them a link to the front players or any natural width no wonder their midfielders struggled they didn’t have an out ball. When Tabarez came in, 2006, i think, he said he was going to play 433. Recoba was still around and fit. Terrible things happened. Then he found Fabian Canobbio, the one that wasnt this or that for Rafa Benítez. Then he was no more and Recoba started playing as a segunda punta with Forlán. Then Recoba quit and aged, not in that order, and Tabárez found a young player from Danubio. He was a classic number 10. But he played with another number ten turned into a piece of the double pivot, with Gargano by him. It didnt matter: the classic number ten from Danubio got a transfer and a bad knee and ligament, not in that order. A 2010 qualifying match in Bogotá, height, heat. The number 10 wasnt available. After a 0 – 1 won, Tabárez said, or pundits explained: he has chosen to play more directly and from the wings. no more number 10. Pereira wasnt faster, Maxi, but he wasnt such a hothead and on the left Cebolla Rodríguez seemed dangerous. Forlán upfront and a dribbler, Suárez, or an old time tall and dull and oportunistic number 9. A good header. But there were still the preps for 2010 -namely finishing 5th in SA: and Tabárez found Lodeiro, from the under 20 national team process, and Club Nacional de Football 2009 Copa Libertadores campaign. The classic number 10 had recovered and was having minutes in greece. So in a friendly -vs. israel?- Lodeiro and him came in during the second half and it was football as the national teams had not seen since the qualifying match in Morumbí in 2007. He had found the 10, or the almost nines: mediapuntas. But he also had found a midfield that made everyone confident to endure and attack from time to time. Previously, the man doomed destroy and built from behind had been Pablo García, the most beautifully left footed number 5 Uruguay has seen in years. He quit, got old. Not in that order either: so tabárez found Arévalo and Pérez and benched Gargano. Then it was the wc, Ignacio González number 10 started against France. The ball flew from one side of the pitch to the other; the team had no use for him, and he didnt appear confident. LOdeiro came in in second half. Lodeiro got expelled. No more González. Cavani next, as 4 bis, Forlán to drop deep, Suárez to dribble. The double pivot stood. Then luck and not the worst of rivals. Then bad refereeing agaisnt Holland. Then awful Muslera against the Germans. But as ZM points out, Lodeiro got hurt during the Ghana tragic one hundred and some more time till the hand and missed years of games and is now a tamed player in a tamed brazilian team. And he played alongside Seedorf. Those were his best matches. Then gastón Ramírez: but he wasnt a number 10 till he was bought by Bologna. And even in Bologna he played segunda punta and alongside the real left foot marvel: Diamanti. Its not that he hasnt got better at Southampton: he was always like that. And what does a Tabárez coached Uruguay need from a number 10? A shot, a goal. And bioenhancement. And not one of the players ive pointed out are alike Pastore, for instance. Actual southamerican playmakers. (The moon and the stars is Riquelme. The power and the glory.) They are closer, when well: to Aimar, to Sneider, to Kaká. When Shinning. Game of their lives. My opinion therefore: theres no way out in the near future. Gaston Ramírez and Lodeiro wont provide total footbal. I agree Uruguay played more a 4 1 3 2; it served them well agaisnt Poland. Lodeiro played that game: but Cavani and Suárez were on the field. And although Forlán was the best player in that 1st half of Costa Rica catastrophe, or the only one that understood how to play them, Tabárez took him off the field. Is he betting all in the mata-mata against the Euro teams? The substitutions shut down both the left and the right channels pointing to a reaction, and if Uruguay miss something is their best crosser from the early 00`s. Uncharacteristically: Paolo Montero. Or not. It is funny. In the Japan preview analysis it was written that in the eventuality of a defensive minded tournament, Japan would be amongst the few to break the mold, however the tournament has been open with quite a lot of attacking even for the teams whose tactical predisposition is to defend (see Costa Rica). Japan has been the only one to play what I would classify as negative football. Their two lines of four often became a line of six at the deepest, they refused to build up beyond their own half, and every player included the goalkeeper were obviously told to hit the ball long when in possession, and hope Honda or Okazaki managed to control such directionless balls. You asked “Does Japan’s possession play hide their weaknesses?” And the answer is an obvious yes. Both men and women’s football (specially u20, u17) find themselves up against physically stronger and bigger opposition, so they appeal to ball possession to avoid 50-50 balls as much as possible. But Zaccheroni’s insistence on a 4-2-3-1 has always elongated the team too much, hence there is not much predisposition to build numbers in the midfield, and you see players making runs on the sides that require awfully clever and precise passing, but even when they manage that, they usually find a cross to the box as the only option, it has never made sense for me, and it happened repeatedly during qualification. But today was a first, I have never seen Japan so uninterested in playing football, I have never seen Japan actively using a line of six. I am one of those that believe that Japan will be the next thing, but Zaccheroni has become an unnecessary delay, it seems he was just never able to understand japanese football, going against an uniform style in all Japan’s national teams, at all age categories, regardless of gender. Or maybe he just refuses to follow, but will ultimately do the same as in the Confederations when against Italy: allow the players to become tight and mobile to retain possession to gradually push the opposition back, and give the players freedom to do that characteristic spontaneous dribbling in the last third, to change the rhythm and break the defense. Still in the Confederations, they went back to that long 4-2-3-1 in the third match, and looked as helpless and hopeless as they did in the first, and went back home with no points. Any idea why Verratti was so subdued yesterday? Barely pressed at all and had all the time but kept passing to Pirlo or DDR. I guess only tried one long ball and one run. Was he overrawed by the occasion? He certainly was never this uninventive in PSG colours. I am guessing he don’t want to screw up in his first world cup match. He got loads of talent and is already a very good footballer, i think he just needs a couple of games to get confident. When it comes to Greece, you surprise me these days. After an objective take on our 2004 success that was in stark contrast to the typical endless complaining about us, you seem to just shrug us off completely- probably not the smartest move given out consistency in qualifying for major tournaments and our ability to win in them and progress, as in 2012. Namely, what surprises me is your analysis brushing off our side of yesterday’s game completely. Many neutral observers have come out and said the score line was flattering to the Colombians, and your analysis is indeed quite bare as you don’t even address the fact that we had more possession and a similar number of shots on goal. You fail to mention the chances we created and the generally excellent crosses from Torosidis, although you do seen to imply that the very poor Gekas was unable to get on the other end of them. Anyway, I’m sure you’re busy having to cover all the games, but your analysis of the match was a major let-down for Greece supporters, especially given all the media groupthink about how defensive we supposedly are being constantly propagated, even though Colombia were the ones sitting back until the 75th minute. The difference is how deadly and fast Colombia were on the counter attack. Sorry, I just thought it was a lifeless and very flat performance. I don’t think there was anything particularly noteworthy about the Greek approach. They weren’t terrible, but honestly – what would say was of interest? Especially considering this was a day featuring three much more exciting games? I don’t know what I can say, that isn’t just saying things for the sake of it. What is there to say about Greece??? They keep qualifying mainly because they are lucky with the preliminary draw because of their good FIFA position. A very boring team in many aspects. Your whole site is predicated upon saying things for the sake of it lol. That’s why people give you clicks, so they can read your insights. If you were too busy that’s fine just say it. It’s just the biggest football tournament that comes every 4 years. -Colombia strangely sat back for most of the game. Why? Conserving energy in the heat once they were a goal up, part of their tactics? Players not following instructions? Your take? Greece is one of the weakest and by far the most static and boring team of the tournament. A little bit of talent from a couple of players (Samaras, Papastathopoulos, Torosidis) and that’s all. Her supposed strengths are efficient team defense and good set-pieces in offense and defense. None of the above was displayed against Colombia. England were disappointingly naive and doesn’t bode well for the rest of the tournament. This wasn’t a must win game yet England were attacking with numbers and using so much energy up in the first half. Italy just soaked up the pressure, played around England and then took advantage in the second half, overloading the right flank once again and then shutting the game down. This sort of tactical play is something England always miss, it’s like we only know one way to play, run around a lot and get stuck in. If anything Italy overrated us and played too cautiously, they could have got away without playing verrati, moving marchisio inside (more likely to make runs forward and a bigger goal threat) and played a more attacking option on the right like Insigne. For England playing all three of Sturridge, Rooney and Sterling was always going to leave us defensively weak. Fans dislke Milner, but he would have been perfect for this game, protecting Baines and providing a better balance in midfield. Welbeck played well and was arguably the only forward player trying to make the system work; making unselfish runs and keeping width down the right. I was also surprised Lallana didn’t start, he is one the few English players that can read the game well and has also turned himself into a good finisher this season. Lallana playing centrally could have given Englands attack a different dimension, rather than just pace, pace and more pace. Sterling, while an excellent young player, ran out of steam in the second half and it would have made more sense to bring him on off the bench against the tiring Italian defence, giving the england attack a breath of fresh air. Finally I was disappointed with Sturridge, his link up play left a lot to be desired of without Rooney in behind him and was kept rather quiet by the Italian defence aside from his goal. I would ideally have played Milner and Welbeck wide, Lallana through the middle and Rooney up top (dropping deep to link play and dragging out Italian defenders). Luckily for England, Uruguay were left embarrassed by Costa Rica and looked lost without Suarez to direct their attack. It will be a tougher test for England I think however, as England will likely be the more proactive side, leaving space inbehind for the counter attacking of Uruguay. While England looked lost themselves when asked to break down a deep Italian defence. I would therefore go with Lallana and Welbeck out wide and Rooney and Sturridge in central positions. Uruguay’s CM’s are unlikely to get forward, so Rooney will not have any defensive responsibility, giving him the creative freedom he needs to inspire Englands attacks. Sturridge can pin back the defence to create room for him, while Lallana can move inside to link up with Rooney and Welbeck can provide width and penetration on the other side. Baines and Johnson will be key as well, getting forward to help overload the defence but not leaving too much space in behind on the break. Gerrard and Henderson will have to remain cautious in deep midfield and look to move outwide to cover the fullbacks if needed, as there remains little threat of midfield runners from Uruguay. The other games were all quite interesting as well, and there hasn’t been boring games so far at this world cup. The key for Colombia seemed to be pinning back the Greek fullbacks. They are the biggest threat of this team, linking up with the wingers to provide chances for Gekas. This happened sporadically through the match, but not consistently enough to provide a real threat and only opened up space for the Colombian wingers. Greece should fair better against less dominant sides, though the match against Ivory Coast could be interesting, with both sides looking to get their fullbacks forward. Japan were surprisingly defensive and gave the most disappointing performance. Their strength is in their varied possession game and against the technically weaker Ivory Coast team, they should have dominated the ball. But they sat back after going ahead early and like ZM says, were completely exposed defensively. They look unlikely to go through now, with Colombia a much stronger team and Greece’s set piece ability worrying. Ivory Coasts big game will be against Greece and the battle of the fullbacks. So was that basically the same mistake Joachim Löw made in the semi-finals 2012, when he shifted Özil to the right to field the defensively more responsible Kroos against Pirlo, thus crucially allowing many dangerous attacks down that flank, including the one leading to Italy’s first goal? About the England – Italy game, it should also be pointed out that both teams enjoyed a 2v1 situation on the right side of the pitch: Italy due to Rooney’s lack of defensive workrate, England because the inside drifting of Marchisio allowed Johnson to bomb forward and support the attack. That’s why Chiellini and Paletta had more than an issue containing the attacks from their zone of influence. Chiellini was awful. Worst player on the pitch. The one that actually tractor-ed that Sterling kid, which everyone for some reason prizes for well played game (did not know that shooting from 30 meters out of the goal is a well played game)? I honestly think the central defender Chielo put on the left back ate him from breakfast. I thought italy’s fullback didn’t give much chance to either rooney, welbeck, sterling or sturridge or even lallana for almost the whole match- seriously there was really a gulf in what’s expected of england’s wingers vs what actually took place. except of course for the terrible defending of palleta — again. 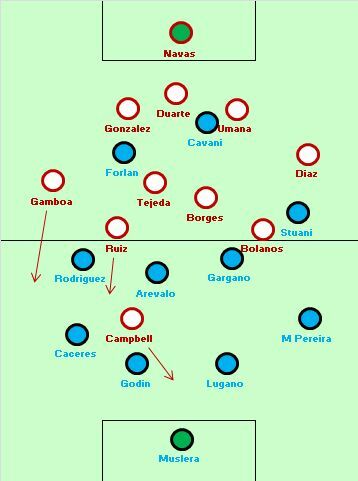 your analysis of the ENG-ITA game was nice; i think besides the fact that italy were free to attack down the right flank there was another -crucial- point which led to the defeat of England. There was no really cohesive defensive shape throughout the match. You could see England defending in two banks of four. This is quite a basic approach when you want to sit deep -which england has to do due to the lack of pace of jagielka und cahill – and can be successfull against a side with good ball retention. But what England didn’t do well was their defensive movement as a team. They left too much space between the tho banks of four in front of the defence where balotelli, candreva and marchisio could often receive an easy through ball into feet. Jagielka an Cahill were reluctant to step out of their position to prevent those passes. On the other side Gerrard and Henderson simply were not aware of the space they left behind them while they were wandering from left to right. This double pivot simply does not work against strong opposition because neither of the two is able to sit deep an protect the centrebacks or cover the flanks while the fullback is attacking. From my point of view Hodgson has to decide whether he wants his team to sit deep and focus on quick transitions or if he wants them to press (occasionally). What they did against Italy was interesting but seemed uncertain and eventually cost them a good result. 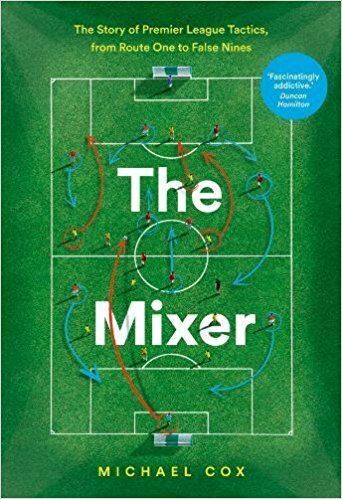 As you mentioned it would make sense to bring in a hard working wide player like James Milner or to field a true holding midfield player – which england frankly does not have . The best tinkering of the side might be to switch to a 4-3-3 and adding a another central midfielder to balance the side. On the Offensive end England was quite exciting with raheem sterling bringing some invention and creativity from the number 10 position to the team that was missing for years. What’s mystifying is that in your piece you noted that Forlan has become more of a No.10 player, and has less mobility these days, and Cavani normally plays as the link between midfield and strikers. So why didn’t Forlan play up front and Cavani play in behind? Also, I’m curious to hear your thoughts on the Rooney conundrum – it feels to me like wherever he will play, he will be putting someone in form out of position. I’m almost hoping your speculation that Lallana could replace Rooney if something happened to him can come true – if Argentina can drop Tevez to help the system, can England drop Rooney for the same purpose? One Japanese I talked to asserted that the overly defensive playstyle the Japanese team exhibited isn’t a choice but actually a symptom of a different problem–essentially, this year the Japanese are leaning heavily upon their international club players, who frequently do not play full 90-minute games for their clubs. This in turn causes their offensive vigor to taper off rapidly after the first third of the game or so, either because they lack stamina or because they’re not accustomed to pacing their stamina to a full game, which results in the appearance of a defensive mindset.